Thank you to RedwoodEmpireRunning.com and the Sonoma County cross country community for your palpable help in getting the word out and embodying generosity in resourcing a care package of gift cards for the Paradise High School (PHS) cross country team. In just one week the students and families from Maria Carrillo HS, Santa Rosa HS, Windsor HS, plus anonymous donors raised $1,500 to show our love and support for the runners at Paradise. Based on our memories of our own fires in 2017, two parents from Maria Carrillo set out to track down the PHS coaches at the state meeting this last weekend. After walking Woodward Park and nearly giving up, Tim Armstrong saw a man walking down the hill wearing a PHS shirt. He stopped him and learned that this man was an Assistant Coach and soon they were walking to meet the Head Coach Tommy Harris, as well as their two state qualifiers Gabe Price and Patrick Roehling. At the time they were hanging with the Dana Hills HS team, who had invited them to use their tent and gear. See picture below of Patrick (second from right), Tim, Coach Harris, and Gabe (in the Dana Hills sweatshirt). Tim was blown away by Coach Tommy, his team, and all those around them that day. They were warm and friendly and receptive to genuine offers of help, despite a devastating blow to their homes, families, school, and community. At the time, Tim didn’t have our care package and so he offered our words of solidarity and support from people who know what it’s like to watch the fires sweep through. He hoped to find them later before the day was through. In fact, they did find them later, as Gabe and Patrick ran the second to last race of the day. 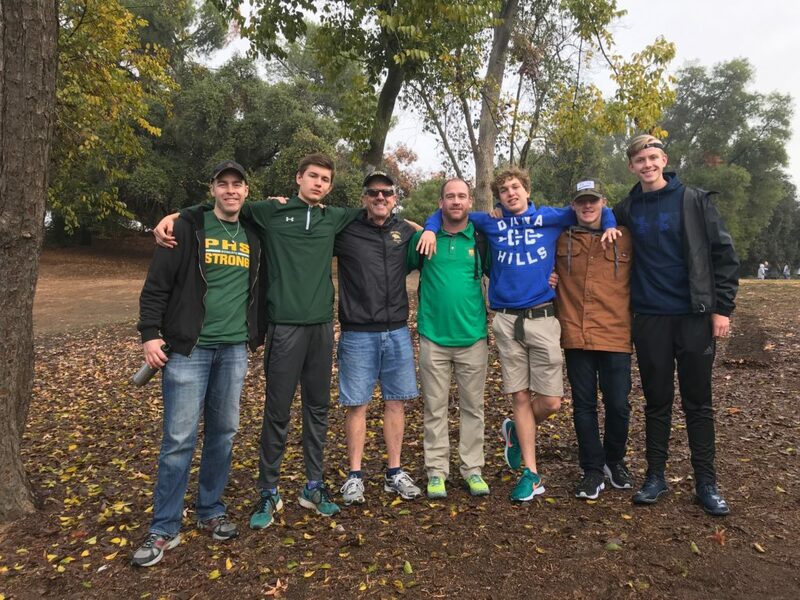 They were cheered on by fellow survivors of the Camp Fire, attendees, and the race announcer who made sure people understood the significance of this race for PHS. It was clear from race reports and their own post-race interviews that the disruption of the fires caught up with them and they struggled to hold tempo to the end. They finished well out of the medals and yet in the eyes of their supporters, the announcers, their adopted sister squad (Chico HS) and the Sonoma County teams cheering them on, they were true heroes. Before the day was through, another Carrillo parent Dana found Coach Tommy and was able to give him our care package of gifts cards and a signed card from the students. Tim was also able to exchange contact info and pledge to reach out soon to understand how we can support them with the upcoming months (and the impending track season). 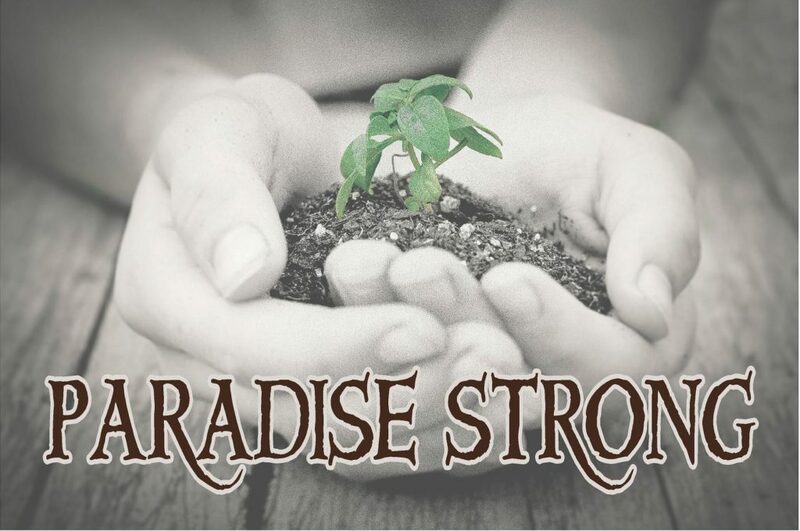 He also provided 30 #ParadiseStrong yard signs, similar to the ones he created for friends after the fires last year in Sonoma County (Tim owns a sign company). He found the picture of hands cradling a small sprout and knew this was the metaphor for what fire victims experience; specifically, that a community can find hope together, and that life can rise from the ashes. Since Saturday, additional gift cards have continue to come in. If you still would like to donate, or have ideas of how to show support, we are preparing a second care package. Please contact Samantha or Patrick Donohue at samanthad707@gmail.com for more information. P.S. Let’s also not forget that there are many among us here in our own area that are still recovering from our fires and need our support. This is a multi-year process. Let’s continue to be aware of needs around us and humbly offer whatever we can. I heard someone say recently that “no act of love is too small.” Let’s continue to live that out and celebrate it when we see it around us.